Catering to the requirements of our clients, we are indulged in providing a flawless quality range of Color Sorting Machine to our clients. 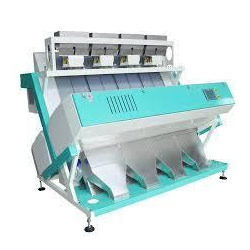 Offered Color Sorting Machines are manufactured using qualitative material and latest technology. Besides, these products are used to sort items based on color difference in food processing industry. Mill Master Machinery Pvt. Ltd. produces a comprehensive range of individual machines, complete integrated projects and total Turnkey Projects in the rice processing industry. We offer complete solution in modernization of rice processing mills and we achieve this through a complete innovation and technology, team effort with reliability, continuous development in machineries quality, design systemization and manufacturing process, last but not the least into the customer service and support. We are a team having a rich experience of around 12 Years developing and researching innovative way for modern rice mills. We have worked with many turnkey and individual projects across India and across the globe. We had a passion to start an organization in rice milling field hence we have started with a name which stuck our mind where we understood that it is a field which servers quality and better food for the world. We deal with all kinds of rice milling machines in our own brand. We export our 30-40% products to Nepal, Srilanka, Bangladesh, US, South, North Africa, Myanmar, Thailand, Indonesia, Singapore, etc.